It takes less energy to make TAP insulation, less energy to heat and cool your home, and no environmental hazard if ever removed. 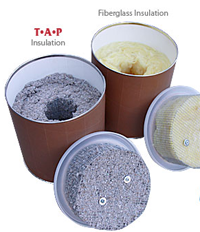 Thermal insulation is a material having air-filled cells or voids, or heat-reflective surfaces, which retard the transfer of heat to cold. Acoustical insulation retards the transmission of sound. Pest Control insulation, while performing the primary functions of thermal and acoustical, is labeled to control listed pests. All-Natural, permanent, and environmentally friendly, too. TAP is green! Well, not in color, but TAP is permanent, made from all-natural boric acid and recycled newsprint, thus while you're saving energy, you're also conserving landfill space. 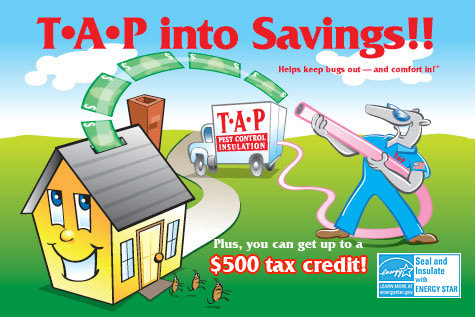 TAP has earned the US EPA's "Energy Star" designation.